I think I’m addicted to Protopic. There, I’ve said it. I’ve been using Protopic now since July this year, just four months, and in that time I feel transformed. It really has completely changed the way I look, the way I feel, the way I live my life. It has changed my life. Literally. And I am not exaggerating or making this up. Going from regular, often weekly full face flare-ups, a constant pink glow and never knowing what triggers the reactions to clear skin in weeks is pretty life changing. Should it matter so much what I look like? Maybe not, but I just feel so amazingly different. As a woman, having red angry skin is pretty awful. People judge you. They assume you don’t look after your skin, you should visit your doctor, you should cover up with make-up, they look at you and wonder how you ever leave the house looking like that. But what other options do I have? I have to live my life and I have to say, living it with my new clear skinned face is just a million times easier. Can you blame me for feeling quite so under the spell of my immuno suppressant? I feel calmer, less stressed, the pain of getting through a day with tight, sore, itchy, dry skin and endless pain does take its toll. I never realised how painful my skin was until it was better. So now I’m attacking the knotty subject of reducing my dose. I tried before in August but it backfired so I’ve carried on using it twice a day but I know I have to start cutting back. But what I if I cut out an application and it flares up? What if I cut down and it flares up and never gets better? I have been putting off the inevitable moment for weeks, yes weeks! Telling myself I would miss out an application tomorrow, then finding I had put it on as normal, knowing I shouldn’t but not able to stop. I am addicted. I can’t stop using this stuff. What if I can’t have Protopic any more? The panic at the thought of that is just too much. But for anyone thinking they need to cut back. 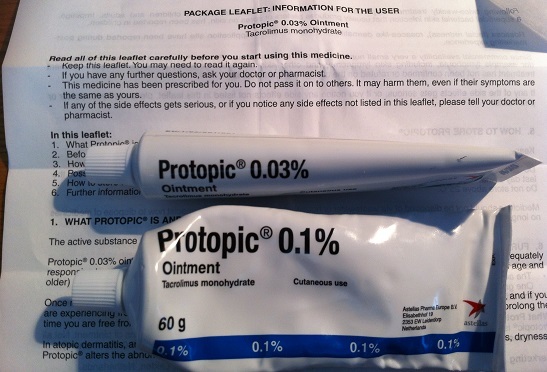 Anyone who is using Protopic whose doctor is advising reducing the applications, it can be done and for me, it’s working. For two weeks now I’ve been applying just in the morning, not in the evening. My skin is still clear. I still get the usual side effects, some facial flushing sensations if I get hot, like when opening the oven for instance and my face does flush if I drink alcohol. The next step is to apply just once every other day. Then just a couple of times a week. A maintenance dose at weekends is the next step and if the skin is still clear you can cut back even more. I am not going to become a slave to Protopic. It has saved my skin but I am in control again. I don’t like having to use any medication long term, even though I know it is not thinning my skin it still worries me a little. Anyone else who uses it managed to cut back successfully? Did you find it easy to reduce applications?